When Catherine Morland, a country clergyman's daughter, is invited to spend a season in Bath with the fashionable high society, little does she imagine the delights and perils that await her. Captivated and disconcerted by what she finds, and introduced to the joys of "Gothic novels" by her new friend, Isabella, Catherine longs for mystery and romance. When she is invited to stay with the beguiling Henry Tilney and his family at Northanger Abbey, she expects mystery and intrigue at every turn. However, the truth turns out to be even stranger than fiction. I am a manly man. I eat raw meat. I speak in short sentences. but i love this book. It's not just a Jane Austen romance, it's a mini thriller and comedy too. John Thorpe is my idle. 101 sur 106 personne(s) ont trouvé cet avis utile. Juliet Stevenson is my favorite reader for Jane Austen novels. She has a pleasing alto voice, and gives a very lively reading. Ms. Stevenson gives all of Jane's characters distinct voices and personalities. I recommend this audiobook highly! Northanger Abbey read by Juliet Stevenson was great fun: absorbing, witty, and even, strangely enough (for an anti-Gothic romance), suspenseful. Seventeen-year-old Catherine Morland is an appealing heroine: ex-tomboy, unaccomplished at the things a typical young lady of her era would be accomplished at (playing the piano, drawing, etc. ), obsessed with Gothic romance novels, honest, good-natured, sensitive, innocent, and ignorant. Watching her mature through the course of her first experience away from home (first in Bath and finally from about half way through the novel in Northanger Abbey) into a greater awareness of the feelings and true nature of other people and of herself is satisfying. And the reader, Juliet Stevenson, is wonderful! She brings the story to life, playing an experienced and wry narrator, as well as pleasurably capturing Catherine's innocent ohs, nos, and honesty, Isabella Thorpe's insincere effusions, John Thorpe's boorish boasting, and Henry Tilney's clever teasing and kind advice. 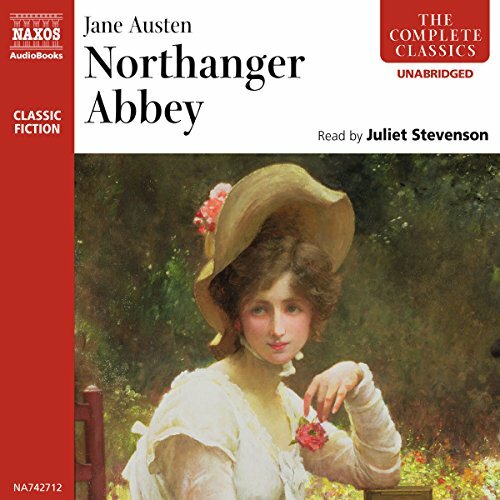 As some other listeners have said, Northanger Abbey is not up to the level of Jane Austen's best novels, but it humorously plays with the Gothic romance genre that was so popular in the late 18th and early 19th centuries, offers plenty of quotable lines, and, especially as read by Juliet Stevenson, makes a charming and enjoyable audiobook. 42 sur 47 personne(s) ont trouvé cet avis utile. Another great Austen novel beautifully read by Juliet Stevenson. She is my favorite narrator. Like many other Austen readers, this is my least favorite Austen novel. It was only on re-reading it as an adult (and after slogging through some of the meodramatic novels Austen satirizes) that I finally got the satire. Narrator Stevenson really enlivens the reading to so that the tone can't be missed or messed. I've listened to two other audio versions of Northanger, and this strikes me as by far the best - satiric but not "over the top" delivery. Juliet Stevenson is a wonderful narrator and does a great job reading what is unfortunately not the best of Jane Austen's books. Although the story is pleasant enough, it isn't up to Pride and Prejudice, or Sense and Sensibility, Emma or Mansfield Park. The story lacks complexity, the characters are merely sketched, and it just doesn't hold your interest like the other Austen works. The narration, however, is terrific. This was a fun, light-hearted romp, but not one of Austen's best works. It had her characteristic humor, and I love the way she delivers both approbation and condemnation in such wry, genteel turns of phrase. Austen's world is a Regency fairyland where nothing truly violent or horrific ever happens, which makes Catherine Morland, the 17-year-old heroine of Northanger Abbey all the more endearing. Catherine reads lots of gothic novels, and would like nothing better than to be trapped in a haunted house, discover that the local baronet is hiding his mad wife in an attic, find a mysterious orphan on her doorstep, uncover a wicked poisoning plot, etc. Sadly, no such dramatic events occur during her stay in Bath, but she does make friends with the Allens, the Thorpes, and the Tilneys, leading to a typical Austen comedy of manners with misunderstandings, deceptions, attachments, broken engagements, etc. Catherine is a sweet former tomboy who still has a vivid imagination and a taste for adventure. She grows up over the course of her little adventure, making friends, figuring out that not everyone can be taken at face value, and that she shouldn't try to fit real people into the plots of gothic novels. Also, Austen has a lot of fun name-checking fellow authors, honoring some and making fun of others, and defending the novel as a legitimate work of art. However, the ending was rushed and had none of the humor or wit of the first part, like Austen had a fun time writing about her overly-imaginative heroine and her adventures for the first part of the book, and then said, "Oh, well, I guess I'd better write the happy ending now." So all misunderstandings are cleared up and Catherine is suitably settled in the last chapter, mostly through a lot of exposition. So, an enjoyable but a lightweight book without the depth of some of Austen's other works. This was a "first" Austen work for me. It was an excellent work to begin with. Wonderfully read and wonderfully written. I am so very glad I reread this! I know I read it sometime in either middle or high school, but other than the part about Northanger Abbey itself (which is actually a little short despite being what the whole novel was named after), I didn't remember the majority of the story at all, so it was practically brand new to me. As always, Austen knew how to write likable and intentionally unlikable characters, and makes the relationship drama compelling, and sometimes even funny. I particularly loved our heroine, Catherine, and her bookish nature, and Mr. Tilney may be my favorite Austen hero yet. On the technical side of things, I wanted to note how I've found that, as long as I find a good narrator, I enjoy Austen a lot more when I can hear it read aloud. It's not that I don't enjoy it when I read it the normal way, it's just that I don't seem to get as bogged down by the old-style language on audio. I also love when I find a narrator who does different character voices well because it adds that much more life to the story. This narrator was Juliet Stevenson, and she is, by far, the best Austen narrator I've found. I never once got confused as to who was talking, (unlike when I listened to a different narrator for a different Austen book) and she really made it fun. I liked Ms. Stevenson's reading so much, that I fully intend to make sure all the rest of my Austen listening is narrated by her. In fact, I've already checked and it looks like she has indeed narrated all of Austin's books. YAY! I have never "read" a Jane Austin book before, but listening to this one was quite entertaining as well as historically interesting. A light book, full of fun. I usually love Juliet Stevenson, but I was not too happy with the way she voiced the main character, Catherine, in this audiobook - always very breathless, simpering and high pitched. She didn't really relay the amount of satire in this book either. I'd look for a different version. I really like the style of how Ms. Stevenson reads! Five stars for this beautifully read audiobook! Another classic tale of (allow me the slight spoiler) "parental tyranny" or "filial disobedience" read by the incomparable Juliet Stevenson. I so enjoyed this recording – just having finished it, I'm a little at a loss for words...modern ones at any rate: Georgian artfulness comes easy after a treat like this. Highly recommended!